Color. Some of our earliest memories involving color will stem from coloring crayons. The crayon is one of the few things that nearly the entire world population has experienced at one time in their life; regardless of cultures or geographies. And yet such a common and simple instrument of imagination has a virtually untold story as to how it came to be. I began collecting crayons as a way to fill some shelving I had used for an early collection that I had sold off because it got too expensive to collect. I wanted to collect something that represented Americana. Something that had some age to it. Something that wouldn’t readily be thought of as an item to collect. Something that wasn’t very expensive. Something that wasn’t too large but that I could display without running out of room quickly. Something I could continue to collect and not have to worry about running out of new items to find but that wasn’t so large that I felt like a drop of water in a vast collectible ocean. That was a lot of somethings! Crayons fit all of that criteria. At first I began to pick up whatever I could find available at retail, in antique stores and on eBay. I would later deploy private investigator like skills I had acquired as a savvy collector over the years to find items outside of the conventional ways. The basic notion is to ask yourself where you would most likely be found if you were a vintage crayon that was saved over the years? Teachers? Artists? The process goes from there. As I got into the older, vintage items, I became more and more interested in the overall history of the industry. Where did crayons come from? How old were they? How many different manufacturers and companies were there, that sold them? I knew going into the pursuit that there were no guidebooks for me to collect from but I was surprised to find out that there was also no history written about the crayon. Here, deep into this age of the internet, blogging, social media and self-publishing was an entire industry undocumented and without research. And some data on the internet wasn’t accurate; even information from the industry’s largest companies. When I started to really accumulate the crayon boxes, I began to do my own research into the questions that came up around crayon history. After visiting the Smithsonian, I quickly realized that my own collection had grown to dwarf any other collection out there. Using a combination of Google Books for periodical research, old catalogs and advertisements from different eras and physical boxes, I was able to put together the pieces of the story of the crayon. The idea to combine a form of wax with pigment actually goes back thousands of years when the Egyptians and Greeks heated waxes with pigment and used them to decorate warships and the walls of tombs. This encaustic painting art form was difficult to master though as it required a “burning in” process to set the colors. The modern wax crayon as we know it has its origins coming from both the art world of pastels and the printing world of lithography. It wasn’t until the introduction of Ceresin in 1874 that the true wax crayon industry began to take form. Though this allowed a cost effective solution for crayons, most of the earliest products came from Europe and with poisonous ingredients that prevented them from being considered in schools and for use with children. The kindergarten movement in the late 1800s along with the origins of using paper as a medium to draw upon led to the demand for a safe, non-poisonous coloring medium that would stay on the paper and require little preparation or clean up. Enter the modern day crayon. 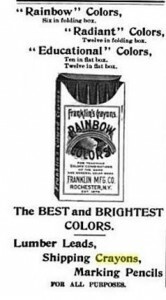 Perhaps the original American wax crayon manufacturer was Franklin Mfg. Company out of Rochester, NY. 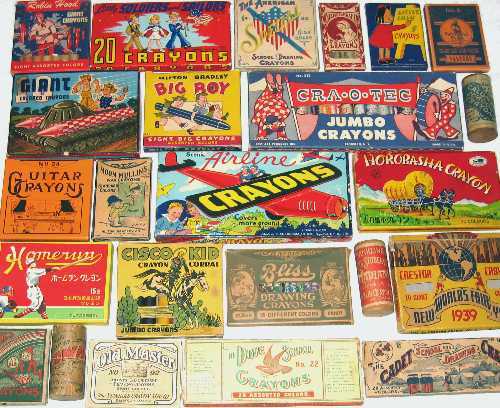 They began operations in 1876 and by 1883 were displaying and selling wax crayons. They introduced the first hard paper tuck crayon boxes that are still used to this day. They were first to introduce the common 8-color and 16-color box sizes. 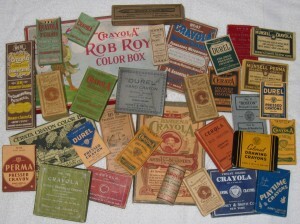 They even put out a 175-crayon box in the 1910s that was eighty years ahead of its time. Companies like Franklin, Standard Crayon, Prang, Dixon, Milton Bradley and Eagle Pencil all had products in the late 1800s and even American Crayon started producing crayons prior to 1903. Still, that date is important because it marks the introduction of Crayola. Many think that Crayola is synonymous with the introduction of the coloring crayon as we know of it. In actuality, the industry had been building for over twenty years prior to their debut. At the time of their introduction, Crayola wasn’t even considered the best quality crayon. That distinction went to European crayons and just a few years later to the Munsell Color Company who were not only regarded as the authority on color at the time but also widely recommended for their high quality coloring crayons. Crayola came in and after a few years of dabbling in the market place focused on being the best quality crayon at the least expensive price. They found a niche between the really cheap and disappointing waxy crayons with low quality and the high quality and more expensive Munsell and European offerings. They were able to grow this niche into a global product through an effective branding of their product unseen in the industry. While other manufacturers kept putting out new and different brands and box designs hoping those would catch on with the consumer, Crayola moved their entire product line to their signature yellow and green design. Relatively few products have had such a similar look to their product for over a century and yet still stayed relevant and fresh. 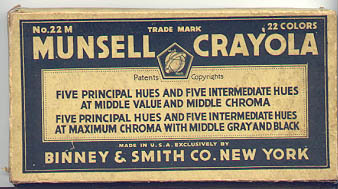 Munsell Color Company’s foray into the crayon industry was a logical output from Albert Munsell’s highly recognized 1905 publication of his scientific work on color notation. 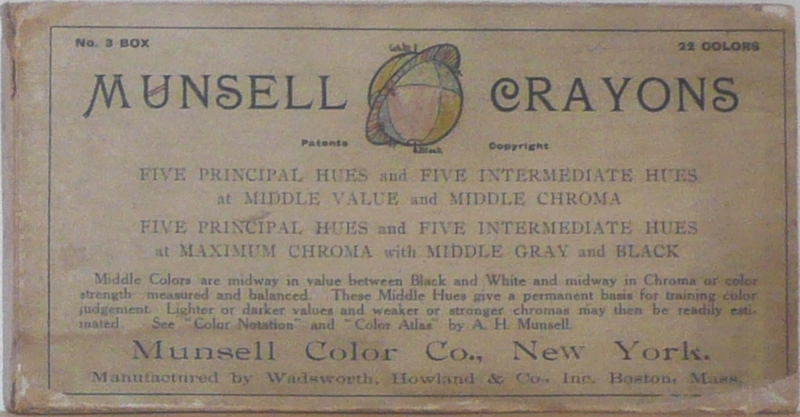 What better way to represent Munsell’s color wheel than through a line of color crayons and in 1906 they used Wadsworth Howland & Co to help produce and distribute their own line of Munsell crayons. By 1924 Crayola had grown large enough that they were looking to expand. They purchased the crayon portion of the Munsell Color Works Company and for a period of time sold two lines of Crayons with the Munsell-Crayola name. 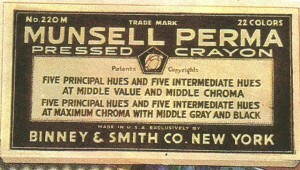 There was a molded crayon version called Munsell-Crayola and a pressed crayon version called Munsell-Perma. This acquisition provided two things for Crayola. First, it gave them an instant foot into the higher end marketplace by attaching their name with the one American crayon manufacturer known for very high quality. Second, it provided them with a full spectrum of colors that they would slowly morph into their own crayon color naming and color wheel offerings. 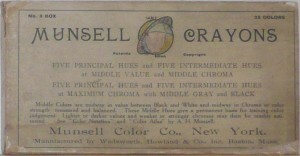 Munsell’s largest crayon color assortment came comprised of 10 maximum and 10 medium color hues (along with Black and White): MAXIMUM BLACK, MAXIMUM BLUE, MAXIMUM BLUE GREEN, MAXIMUM GREEN, MAXIMUM GREEN YELLOW, MAXIMUM PURPLE, MAXIMUM PURPLE BLUE, MAXIMUM RED, MAXIMUM RED PURPLE, MAXIMUM YELLOW, MAXIMUM YELLOW RED, MIDDLE BLUE, MIDDLE BLUE GREEN, MIDDLE GRAY, MIDDLE GREEN, MIDDLE GREEN YELLOW, MIDDLE PURPLE, MIDDLE PURPLE BLUE, MIDDLE RED, MIDDLE RED PURPLE, MIDDLE YELLOW and MIDDLE YELLOW RED. 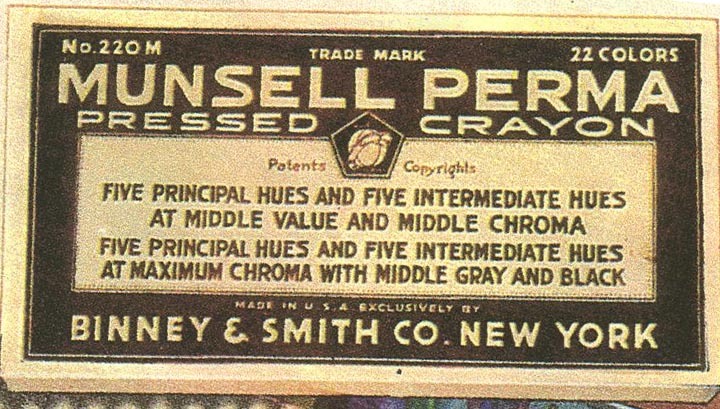 By 1930 Crayola had already adopted using Munsell’s color wheel concept into their own color wheel and began producing a separate version of their product that provided all the colors in the color wheel. They also began slowly making the Munsell colors their own by changing names and removing colors that overlapped from what they had to what they had acquired. In the end, of the original 22 Munsell colors, seven are still available today though under different color names; a testament to the quality and richness of the original colors. And while Munsell practiced a uniformity to their color naming, Crayola has evolved into such a global entity that the very crayon color names themselves generate interest that they’ve been able to capitalize on to generate excitement in the brand and sales for their company. To date, Crayola has produced nearly 300 different unique crayon colors; which probably represent more colors offered up than the entire rest of the crayon industry over its history. But even more astounding is that there are nearly 800 different Crayola color names used for these colors. Many of the basic colors such as Red or Black have numerous crayons with other descriptive color names that associate to that same color because it was renamed for a theme set. Crayola has even used naming contests to generate interest. All of this color naming has spurned a color collecting niche of its own. Suddenly there were people trying to collect every known color name from a Crayola crayon. And Crayola recognizes this and has put out new colors over the years to appease this market. However, in doing so, we’ve gone from easily interpreted color names to highly subjected ones. The color AWESOME for example would be purely a matter of personal opinion even though they’ve chosen a color family to tie it to. I may find a blue shade of crayon to be awesome but not so for a yellow and you may be the complete opposite. Who’s right? In the end, I’ve compiled all of this crayon history and shared many of these stories with various publications and through the internet. It would seem like a book on the subject would be my logical choice to create but early on I found that there were too many new discoveries and that a book would quickly be outdated. 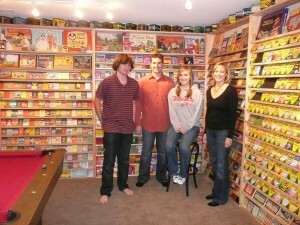 Instead, I created the Web Site Crayoncollecting.com to catalog crayons, their companies and the stories behind them. The web site is a one person operation and so I am sometimes slow to correct or add new material but as I point out to those that write to me, I’m also the only show in town and I offer up the knowledge and information free of charge and without a single advertisement anywhere. I’m using the internet at its very core intent of allowing quality information to be shared. With around 3,000 different crayon boxes in my personal collection, I have reached a saturation of both space and acquisitions to pick up. 60,000 crayons in a single room is a smell that will definitely send you back to your childhood as you walk into a floor to ceiling display that takes up every inch of wall space. While all visitors to my collection are astounded with the sheer volume, I think they’re quite surprised to find so many non-Crayola brands that were produced over the years. While I love my sea of yellow and green Crayola boxes and can immerse myself into the minutia of variations and detail, it is the licensed characters and vibrant graphics of the other crayon products that draw the eye as you walk through my collection. With everything from a box depicting Popeye loading a crayon into a surface-to-air missile as support for the WWII war effort, to a box featuring the family of John F. Kennedy during his presidency. As I had intended in my desires for a collectible, the boxes themselves tell the story of America through their graphics that span over 130 years of our history. Despite the fact that I don’t add a lot to the collection these days, I still get the same thrill of a new box of crayons or uncovering a new piece of knowledge to fit into the jigsaw that forms the history of the industry. And I still answer all of the emails sent to me through my web site. I’m rarely stumped with a question. 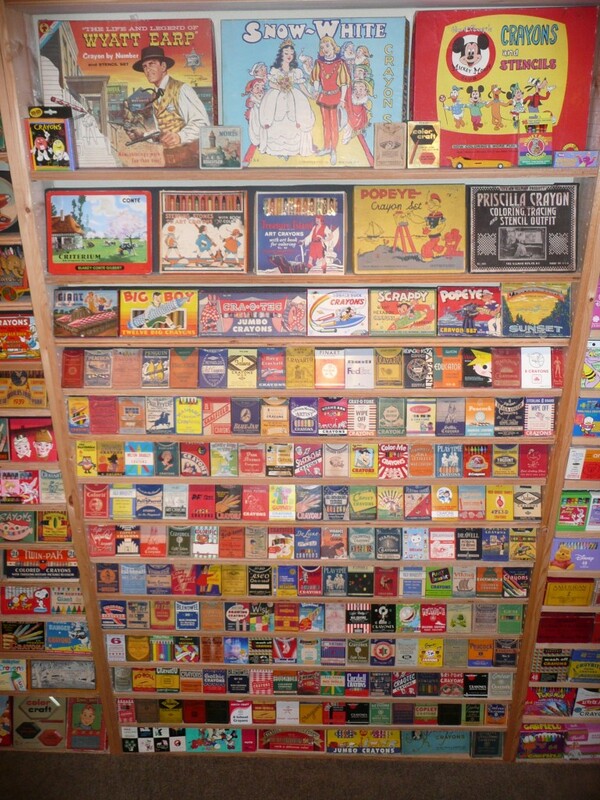 Ed Welter is a collector, crayon historian and author of www.crayoncollecting.com living in Portland, OR with his 3,000 crayon boxes. one is missing what is its value? Do you collect more than boxes? 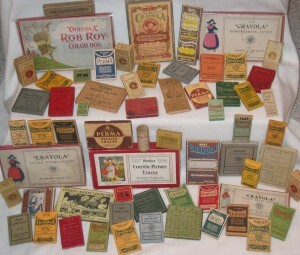 What about tins, vechiles, other crayola kits, poster, memorabilia? Can you tell me anything about the Ideal School and Drawing company crayon sets? I have one that I believe is over 100 years old. I have the box, some crayons and the crayon holder paperboard tube. ANy idea of their value?